A group of us from Wonder Valley met up at the Agave Festival on the Morongo Reservation in Banning. The festival was held at the Malki Museum, produced largely by Daniel McCarthy, and many, many volunteers and participants. I'd met McCarthy at the Desert Institute's Native Plant Uses and at the same lecture at the Old Schoolhouse in Twentynine Palms. Agave (not the tequila kind) was a staple food of the Cahuilla and other native American tribes in the area. There are 20+ tribes in the Mojave Desert. The previous week people had gathered for the agave harvest. It takes nearly a week to prepare the oven and cook the agave. Agave is cooked in a rock-lined pit. McCarthy, an anthropologist, discovered some of these pits during his field work in the desert and reconstructed the ovens and resurrected the practice of roasting agave. McCarthy was thanked by a tribal elder for his work in preserving the traditions associated with the agave. This was their 20th annual festival. A community dinner included roasted agave, rabbit stew, nettle tea, pine nuts, corn bread, acorn mush, squash, beans, yucca whipplei,venison, salad, fry bread, corn, and more. It was delicious. The agave was delicious. Many of us tried pieces of the leaves which we ate like giant artichoke leaves. They were stringy and for the most part you sucked the juice and flesh from the leaf. It was delicious and messy. The heart of the agave was served at dinner. Agave is sweet. Many describe it as a cross between pineapple and sweet potato and that is an apt description. The flavor resonated deeply and tasted like something from childhood, something you want to go back to. Perhaps it was the context that gave it the strong appeal to the senses. 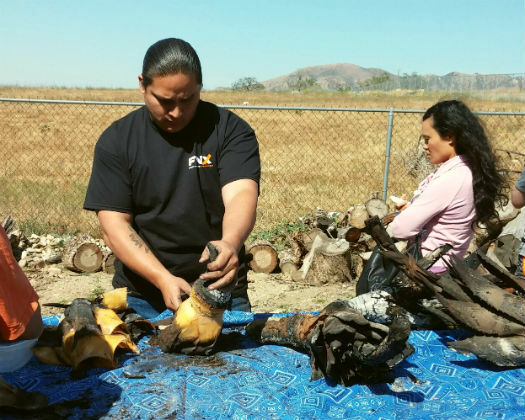 A young man prepares the roasted agave hearts. 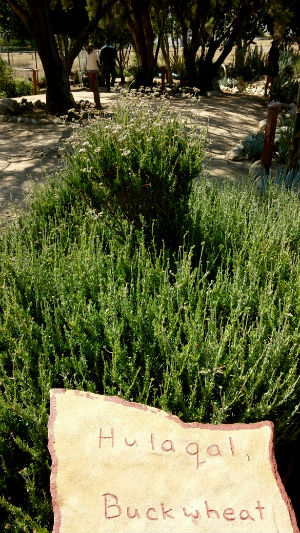 The Malki Museum has a beautiful native garden and I spent a lot of time there familiarizing myself with native plants: jojoba, mesquite, manzanita, elderberry, creosote, ephedra, wild rose and grape, salt bush, sage and more. This is buckwheat (left). I learned that I have long confused this with rosemary. I have found it cultivated at Sunnynook park on the Los Angeles River in a garden showcasing native and drought tolerant plants. I was very excited to see that some of my friends from Los Angeles attended. Erik Knutzen and Kelly Coyne, who wrote The Urban Homestead were there. Erik and I, along with Mark Stambler, founded Los Angeles Bread Bakers. Two other LABB members attended, as well. Erik told me that Joseph Shuldiner, who wrote Pure Vegan: 70 Recipes for Beautiful Meals and Clean Living and who runs The Institute for Domestic Technology, attended the previous week's agave harvest. I was very happy to see the museum, harvest, and festival come to the attention of Los Angeles food authors and advocates. One of the high points of the event for me was the basket making. A group of teenage men and women stood around weaving simple baskets. They were completely absorbed by their task and doing beautiful work. Next time this course is offered I'm taking it. Singers and dancers from the Sherman Indian High School performed. I apologize for not taking more pictures. I wasn't feeling well so didn't make it to all the activities. I'll definitely be going to this next year and hope you can make it, too.